The new Vauxhall Insignia Grand Sport is a handsome large family car that’s great to drive, performs well on the motorway, and it will look sweet on your driveway. It’s the value-for-money choice in a sector swimming with talent. A lot lighter and more affordable than last time, it remains an impeccable offering that’s got the power to tempt buyers away from exec saloons. It’s safe, well-equipped with lots of tech, and its top engines have enough power to cope admirably with a full load. OSV takes a closer look at what it’s all about with our 2017 Vauxhall Insignia Grand Sport review. SUVs are still growing in popularity, but one of their biggest drawbacks is that they sit really high on the road. As a consequence, body lean can be excessively high, which manufacturers often negate with stiffer suspension. The Insignia Grand Sport doesn’t have such a problem. It sits fairly low to the ground and body roll is minimal. There will be some if you take corners too enthusiastically, but it’s not a deal breaker. Instead, what you have here is a suspension setup that absorbs lumps and bumps superbly. The steering is also communicative, and the car fares well out on the motorway. This all adds up to a huge improvement on last time, when driver engagement was a major issue. Once one of the dourest cars to drive, it’s now one of the most exciting large hatchbacks. In terms of its engines, a turbocharged 1.5-litre petrol unit that develops 138bhp is the cheapest. It’s quiet, smooth and does 0-62 in 9.3 seconds. That all sounds fine, but on a full load it might feel overwhelmed. We think the 163bhp variant offers better value. A 2.0-litre turbo petrol engine is also a good, albeit more expensive shout. It produces 256bhp, comes with four-wheel drive as standard, and has a 0-62 time of around 8.0 seconds. It’s not cheap, which makes it the niche choice, but it’s certainly an interesting proposition. Where the diesel engines are concerned, the smallest 1.6-litre power plant develops 108bhp, which is enough to cover the 0-62 dash in 10.9 seconds. That makes it slower than the smallest petrol, but it has lots of pulling power to make it a confident overtaker. A bigger 2.0-litre 168bhp diesel is costlier, but has such strong pulling power and reserves of torque that it will appeal to motorway drivers. On the inside and outside, the Vauxhall looks conservative – but that’s not a bad thing. In fact, there’s nothing wrong with the way it looks at all. Sure, it’s not radical, but everything works well, everything is nicely located, and there are lots of neat touches, such as the frameless touchscreen infotainment screen that’s compatible with Apple CarPlay. Moreover, build quality has got much better. 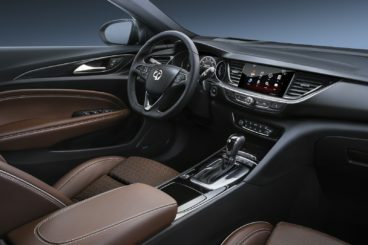 If you need your interiors to look aesthetically pleasing, it’s still worth giving the Vauxhall Insignia Grand Sport a chance. There is nothing wrong with the ergonomics, the seats are super comfortable, and the surfaces feel strong and good to the touch. In terms of out and out quality, the car gets all our thumbs up. In terms of how practical it is, the car holds up very well. It might not have the biggest boot, but 490-litres is still decent, even though it’s smaller than last time. It’s nicely shaped, but a high lip will frustrate. Fold the rear seats and you can extend it to 1,540-litres. Four adults have enough room to get comfy on longer journeys, though space in the rear is more compromised than up front, largely thanks to the sloping roof. Legroom is much better than last time however, and the glovebox and door bins are reasonably sized. There are a lot of trim levels to make your way through, but standard on all models is keyless entry and go, automatic headlights, an infotainment screen and cruise control. The Design Nav trim is our favourite, and it gets a better infotainment system, wi-fi and a digital radio, while the SRi model adds front fog lights, tinted rear windows, a rear spoiler and 17” alloys. The SRi Nav model chucks in more interior lighting, sports seats and sat nav, while the SRi VX-Line Nav trim gets a 4.2” colour driver display, a dark roof headlining, a heated steering wheel and a body kit. Following this is the Tech Line Nav, which gets all-round parking sensors and more chrome detailing, while the Elite Nav model rounds things off with LED headlights, an 8” digital dashboard, a Bose stereo, and all-round leather heated seats. 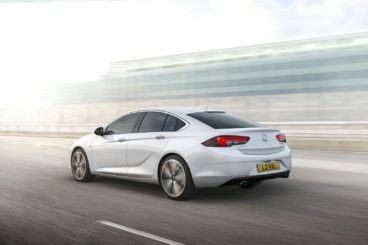 Is the Vauxhall Insignia Grand Sport safe? All models get the brand’s OnStar concierge and safety system, as well as autonomous emergency braking, electronic stability control and a tyre pressure warning system. The car was also awarded 5/5 by Euro NCAP for its crash test performance. Prices for the new car start out from £17,635 and rise to £28,860. If you prefer to lease, you can pick up a deal from £244 + VAT per month. For more information on our leasing deals, check out our page here. In terms of its running costs, the 109bhp 1.6-litre diesel is the most frugal. It returns as much as 70.6mpg economy, while the 134bhp variant returns 65.7mpg. These are good numbers for such a large car, and the 2.0-litre diesel is also affordable to run, averaging as it does 55.4mpg. The petrols will be less attractive if fuel economy is a priority of yours. The turbocharged 2.0-litre petrol returns 32.8mpg, which is close to Aston Martin territory, but the 138bhp 1.5-litre petrol engine returns a more respectable 47.6mpg. It’s very hard to argue with what’s on offer here for a starting price of under £18,000. Heck, it’s lack of body roll and a soft suspension setup even make it enjoyable. If you want a handsome alternative to a full-on SUV, this is an obvious choice. The only thing that stops it from feeling like a premium German car is its lack of badge appeal. And that’s a shame. The smallest of the two is underpowered, while the bigger is far too expensive to run. Let’s see how the car fares against its rivals in the comparison section of our 2017 Vauxhall Insignia Grand Sport review. The new Ford Mondeo has had its image overhauled so that it’s now more commanding-looking than before. It’s not quite as much fun to drive as it once was, but it’s refined and comfortable. Perhaps the reason Ford toned down the Mondeo’s driving experience was to bring it in line with the car’s new austere image. It feels much more grown up, and offers a relaxing rather than entertaining driving experience. Its steering is lighter and quicker, but on the downside it has less feel. In terms of its engines, our top pick is a 1.5-litre EcoBoost petrol. It’s got a satisfying amount of pulling power at all speeds, does 0-62 in 9.2 seconds, and is a quiet cruiser on the motorway. There is a small 1.0-litre petrol engine on offer, in what is an unusual move from Ford. It’s just too small to cope with such a large car on a full load, and we recommend overlooking it. Also disappointing is a 2.0-litre 178bhp diesel engine. It has a 0-62 time of 8.3 seconds but never feels as fast as that, and instead comes across as quite inflexible in the town. It’s also too easy to stall. A 2.0-litre 207bhp diesel, on the other hand, is effortless and smooth. It has a 0-62 time of 7.9 seconds, doesn’t make much noise, and feels right at home on the motorway. A 1.5-litre hybrid engine is available. It’s quiet, but not as cheap to run as the smallest diesel, and its hybrid tech isn’t as cutting edge as rivals. Moreover, its extra weight can make it harder to drive. It returns 70.6mpg economy, but a 1.5-litre diesel engine returns 78.5mpg and is cheaper to buy. All engines are reasonably cheap to run, but the range-topping 2.0-litre EcoBoost petrol engine might price most buyers out with its returns of 38.7mpg and its emissions of 169g/km of CO2. Inside, the Mondeo is well-built, comfortable and boasts more quality than it has done in the past. Where it was once rather plain-looking, it now feels much more alive, thanks to a soft-touch instrument panel and laser-cut quilted leather seats. The dashboard also feels more upmarket than it used to, and we like the new 8” infotainment screen, as well as the rectangular air vents which have replaced the circular ones. Insulation, moreover, is excellent. 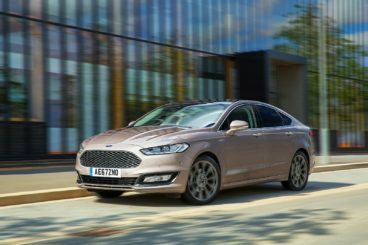 Is the Ford Mondeo practical? It sure is. The Mondeo is 87mm bigger than last time. Rear headroom remains a bit of an issue, but legroom is brilliant. There is a lot of space available, but if you want the car to truly feel as expansive as an exec saloon, add the optional panoramic sunroof. Wide opening doors make access easy, there is no shortage of storage spaces, while the boot measures 528-litres. 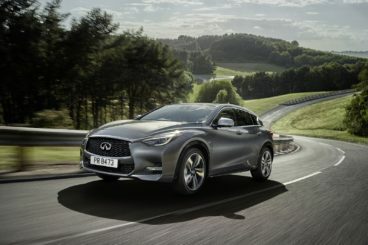 The new Infiniti Q30 Hatchback is the alternative choice as always. Its aggressive design is certainly left-field, but the fact that the car shares a lot of its components with the Mercedes A-Class creates a bit of intrigue. In terms of how it performs on the road, the brand has gone for comfort over driver enjoyment. There isn’t much fun to be had, but if you pick the right engine it’s possible to have a pleasantly relaxing experience. Picking the right engine is key, as the smallest petrol and smallest diesel’s need to be worked too hard to compliment the car’s relaxed nature. We would overlook them both and look straight at the 2.0-litre petrol that develops 208bhp, and the 2.2-litre diesel that develops 168bhp. That said, no engine will improve the way the car handles, but a 2.0-litre turbocharged 208bhp petrol has enough power in its tank to whip you from a standstill to 62mph in 7.2 seconds. It’s expensive, but comes with four-wheel-drive and feels as fast as its numbers suggest. The smallest engines are worth overlooking, but, at the same time, they’re the cheapest to run. A turbo-diesel 1.5-litre 108bhp unit returns as much as 72.4mpg, but the engine runs out of breath far too quickly to make it a solid choice for families. We prefer the 2.2-litre 168bhp diesel, which returns around 69mph and emits just 115g/km of CO2. Inside, there are real touches of luxury to get excited about here. The Infiniti Q30 Hatchback’s cabin feels smooth on the move, insulation is good, and the design itself is nice to look at. As we said, the car shares a lot in common with the Mercedes A-Class, and this shows inside. The quality of the materials is high, we love the suede-effect roof lining, and practicality is good. Headroom is a bit tight in the back, but legroom is fine, while the boot measures a respectable 430-litres. Vauxhall’s aim with this car is for it to compete with the premium German exec saloons. It’s a lofty goal, but there’s just one problem: This car lacks the heritage and sense of prestige, while the brand lacks image and badge appeal. However, we don’t think that should put buyers off, as the new Vauxhall Insignia Grand Sport is a slick, quiet, comfortable, easy to drive and great to live with the car.